1 Blemished Available: $143.96 This item is available as a Blem/Refurb. These are items that cannot be sold as "New" merchandise and are limited to stock on hand. See the product details for a description of the product's condition. When it comes to retro or vintage bikes it is always important to have your gear match the vibe of your ride and for many years that meant wearing either an open face helmet or putting on a crusty old Bell Star or Buco Allsport if you wanted a fullface helmet that looked the part. Well, thanks to the wonderful folks over at Biltwell, the Gringo is here to wrap your head in a combination of old school style and modern safety. The DOT certified Gringo helmet is built to suit the needs of contemporary riders, with a beautifully crafted diamond stitched removable liner, an eyeport that accepts pretty much any type of goggle you could want to wear, as well as 5 snaps that work with any universal 3-snap shield, Biltwell’s own Bubble shield or their 5-snap Blast shield. So next time you hop on your chop or throw a leg over your bike leave that vintage helmet on the shelf where it belongs and grab a Gringo. Bought this helmet for my husband, and am completely thrilled with the product overall. He loves the fit, and look of it, specifically commenting on the simplicity of the design. Thanks for a good product to protect my husband while he rides his motorcycle. Read a few reviews to get a better idea of what size I needed, luckily was able to try the sizes in my range at a local shop. I wear a 7 3/8 fitted hat 58cm-59cm depending on my hair length etc. In the size chart I'm Medium and borderline Large, since I have a intermediate oval shape this helmet fits tighter from forehead to back of the head, so I opted for the large, wasn't a dream fit but was closing enough to be comfortable and not produce any hotspots, I have a narrow cheeks so bought the 33mm XS cheek pads to fine tune the fit, I wear a Medium in a Shoei RF-1100/1200 and X14. obviously these helmets fit spot on due the the shape they are made for. but the gringo in a Large did the trick great style and airflow might because of the narrow cheeks I get a good amount of air flow to my temples. I dig it for hot days or when I'm using my Thruxton or Harley and not my liter bike. other then that build quality looks good for the price point. hope this helps your decision! This helmet is only for the style and riding around town. If you do highway miles, dont buy this helmet. I have about 15k miles with this helmet, maybe more, i like the look, but anything over 70mph it feels like your head is going to tear off and wind noise is very loud over 50mph. My 1960s arthur fulmer helmets are more aerodynamic and comfortable at speeds. But none the less, after all those miles the finish is still nice and the interior is still holding up great. 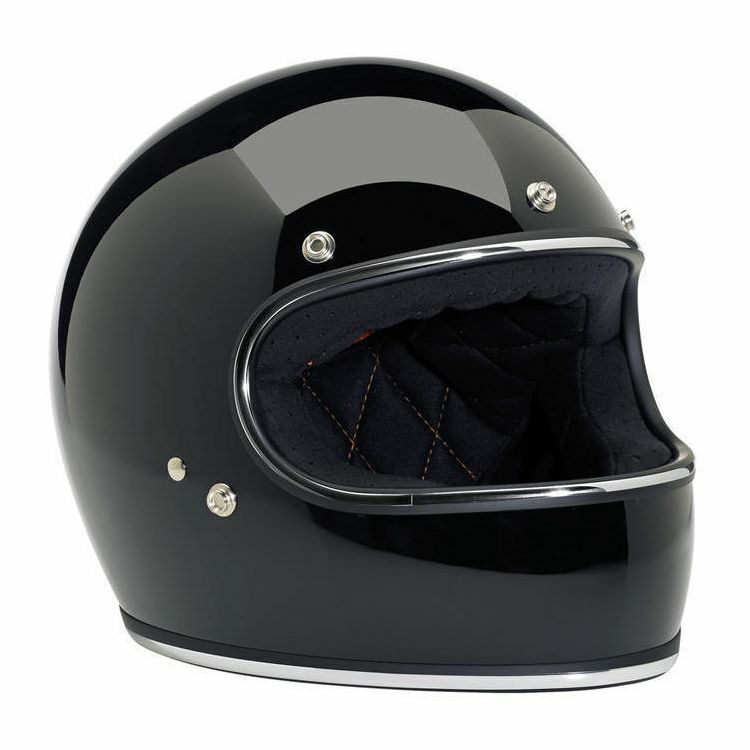 If you want a highway helmet, save up and buy a bullitt, otherwise this is a good helmet. LOVE this helmet. Super comfy. In love with the silver sparkles. 10/10 would recommend. After a few years this helmet has totally fallen apart. These are style pieces, protection is sketchy, I use this to be legal on short trips. Mine is on it's last legs and I would not purchase another product from biltwell. Everything is amazing. only downside to having a matte black style is that it scratches easy and I get white marks. which I have to live with. mo biggie. still make me feel cool. I love that it has a range of colors to choose from, it took me a week to decide. Eventually I got the Baja Blue and I love it! Very stylish and vintage. The comfort is great and my head feels cushioned all around that I can nap wearing it. Sizing is true to size for me. My exact measurement is 53cm and got an XS. I thought I had to order an S since it's my size with the Bell Custom 500. Glad I followed the size chart or I wouldn't be able to return it from the Philippines. Vision is wide enough to see what needs to be seen. The only angle not so much is looking down when checking the speedometer or probably Waze, but it's not really that much of a big deal since I rarely look at the speedometer and I'm in full stop or slow moving when I look at Waze. I haven't rode in it above 50mph so I can't say how much of that air noise I get. It's so far tolerable, but definitely more noise than I comfortably had with the Custom 500. My only negative feedback is that it takes time to put on my shades and flip my face cover up and down, but I'll eventually get the right angle to do those quickly. Very comfortable without sacrificing the style. It's a comfortable helmet with a lot of airflow. Good style, and it is nice to have some chin protection. I have a Gringo S that I have been wearing the last two years and I love it. This helmet is just like it. full face for safety, reviews on fit are all positive, no bells and whistles, great visibility, chicks dig the long ball and this helmet is a home run. Brand and design. Best price. Worth it! Love the look!! And it fits awesome!! Light and comfortable too. Great looks. Good airflow. Chicks dig the look. I chose this item because it fits Oval heads... but I love the retro look too. Its also a great price for a DOT full face helmet. Comfortable helmet. Without a face shield wind can grab the helmet and lift your head at higher speeds. But overall its a good helmet for nice weather, city and low speed country riding. Nice retro looking helmet. Better try them on since it can be a little tight on the forehead. Wanted a full face helmet with no face shield and large opening under chin to allow for airflow in warmer weather. Has a retro style to it and it looks cool ! Full face cruiser helmet; just google images of half helmet crash survivors. wanted something that gives me a nice breeze like a 3/4 helmet with the protection of a full face. Was looking for a retro style helmet that matched my skull and this was the match. Looks great and very comfortable. 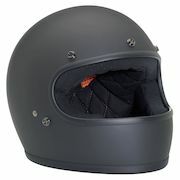 I lost my previous two Biltwell Bonanza helmets in freak accidents. They must be cursed. Hopefully the Gringo will bring better luck. Girlfriend wanted a new helmet and I already had the Gringo S and love it. have a Bonanza but wanted something full face. This helmet is very comfortable and I absolutely love the wide selection of bubble shield colors. Great helmet with plenty of style. I would recommend getting the S class instead though for the added visor protection. light simple built well and awesome. Awesome retro look and extremely comfortable. Oh and its the perfect helmet to customize to your liking. Loved this helmet, I just ordered the S model. Awesome price... great retro look! Is there a cooler looking full face helmet on the market? I also have a pretty big head and have trouble finding helmets to fit that don't give me a massive headache. The reviews say that it should meet my requirements and still look the goods. Really excited for this helmet to turn up. I've wanted one since they were first released. I got it for the simple, classic design. I got the Hazard Orange color and being a new rider I feel a little more confidant in terms of being visible. This helmet has had amazing reviews everywhere I've looked. Thought I'd give it a go as my friends are getting on my case about getting a full face helmet. Excited to give it a go! Best helmet of all time, I have two! I like the old school look and this has a very utilitarian shape to it. no nonsese, no vents, just a simple face/head cover. So there are two shells, one for XS S and M, and one for the larger sizes. Do we know how much bigger the larger one is? Is it a visible difference? Also seeing reviews saying to buy one size smaller, and one size bigger. Would love a definitive answer on this. My head on the tape measure is just under 23" right now, but I have a full head of hair and would be willing to shave it all off. Not sure if people do that and notice a difference in fit. BEST ANSWER: I always need a large, the large fits me fine, a little tight in the cheek pads. This helmet fits rounder heads (front to back) than oval heads. The description on the site says get one size smaller, but in your YouTube video comments, you (CK) recommended to get one size bigger. I wear size M in Shoei (RF-1100) and it fits my extremely well. Which size should I go for here? BEST ANSWER: I am not sure about Shoei sizing, but I have a Med HJC and a Med Licks Nov Dot and some others. The HJC fits me spot on and the Nov Dot did when I first bought it, but after 1 year it stretched out. The Gringo seems a bit like the Nov Dot. I bought a Med and have a feeling it's going to be too big next year. I think a bandanna would work to keep it snug as it stretches out, though. I too have Nov Dot in size M. Thank you for making it easier. I will order size M.
I can't speak to the fit of a Shoei, but it's my understanding that it's similar in size and fit to the Bell Star. If that's the case, I would say the Gringo helmet would fit you similarly to that of the Shoei. The Gringo is slightly bigger, however, than my Bell Star, but I really only notice it when I put the Bell back on, after riding the Gringo for a while. With that in mind, if you are wearing a M now, I would definitely not recommend getting a L. I love the helmet, by the way. It is so much lighter than my Bell Star, and the field of view is great. I bought the goggles, the bubble shield, and the flat shield, but I mainly prefer to just wear shades. It is louder, however, because there's just more wind going through the helmet. Even with the shields on, there is no seal, so the wind cuts through. I hope this helps, let me know if you have any other questions. I wear an XL in a Bell Custom 500 and a Large in AGV RP60. My head measures around 23.75 inches or 60-61cm and a Large Gringo fits me perfectly. Going by Biltwell's size chart, I actually went two sizes lower than they recommended. But with Revzilla's quick shipping and easy return policy, I took the risk knowing I could exchange it if I needed to. I wear a S in Bell Star, and I got a size S in the Gringo, and it fits very well. I understand what you are saying, but if I go by "one size" smaller in description of this page and your comment, I should order "M" as I wear size medium in Shoei. If go by size chart, If should get size "L", and if I go by RevZilla's YouTube comment on the video, I should get size "XL". So I know that the size chart is provided by the manufacturer and they always seem to be off. Some users seem to have commented to go 1 size larger though. Any thoughts on what to get here? I live in Australia so would like to avoid having to send the item back to swap. BEST ANSWER: I wear an XL in both the Gringo and the Bell Custom 500, so... The Gringo is a tad bit bigger than I would like but stepping down to a size Large would be too small. So I guess if you wear a medium in other helmets and that feels a tad big then go with a Small. But if a Medium is kinda snug on other helmets then go with the Medium for the Gringo. Hope this helps. According to the sizing chart I am a medium as well, but I was lucky enough to try one out in person and the Medium felt big on me, I ended up ordering a small and it was perfect. If you normally wear a large in other helmets, stay with a large on the Biltwell Gringo. Hi, can anyone suggest any retro look kind of goggle that suitable with gringo? BEST ANSWER: I think vintage aviator style goggles would be something to look at. I've seen em on several sites from relatively cheap to super sturdy/expensive. The look would totally depend on you the rider though. If you have one in your area, visit a military surplus store. I found some great goggles there all for a really good price, and they look awesome with this helmet. I went with the Biltwell Moto Goggles. Not too retro but they looks great together regardless. I got this helmet and I love it! My head measures 21" and I got the small. It fits in the crown comfortably but loose on my cheeks/chin. Will the top 'break in'? Should I got down a size and get the XS? This is my first helmet so i dont know how tight it needs to be. Thanks. You shouldn't be able to turn the helmet while it's on your head. I've had a Gringo for a few months now and I haven't noticed much "break-in". To me it sounds like your helmet is a little big for you and you may want to go down a size. All helmets should have a snug fit, but not be so tight that you have to cram it on. Make sure your chin strap is tight as well, and keep in mind the gringo chin bar should cover your mouth as intended. Hope this helps. Hey - I have a Bell Custom 500 in size small and it fits me perfectly. Should I expect that a small would be the size to go for in a Gringo? BEST ANSWER: I have a Bell Custom 500 and a Biltwell Gringo, and they are the same size (both large). As others have mentioned, the Biltwell is a little tighter around the cheeks, but I expected that going to a full-face helmet. Tough question to answer because everyone's head shape is different. I can tell you that I usually wear a large and had to order a XL for the Gringo helmet. Had to do with the helmet being so round. love the helmet though. I don't have any experience with Bell, but I have an Arai and a Rockhard, they are both mediums and the both fit snugger than the Gringo. It runs a bit big in my opinion. I wore a large in a HJC helmet but the size chart on Revzillas site recommended a 2XL in the Gringo. The 2XL fit perfect so I would say go with the size chart! I have a Bell Custom 500 large that is a bit too tight on me. Went with the Gringo XL and it is perfect. My guess would be sizes are equivalent. . When I bought mine the smallest size Biltwell offered was Large. I wore a Medium Shoei 1100. The Large Gringo works for me though. I Have a bell custom 500 in large and a gringo in large..also have another full face Bell helmet in large. 23 1/2in round head. I had a bell 500 before as well and I bought the same size in the Gringo as I bought in the 500 and the for was perfect. I had a Bell 500 in XL but went up to xxl in the gringo because I have a larger face. Xxl fit perfectly for me. I don't wear a small, but the larges stay true to size with other brand large helmets I've worn. Just bought my first bike, and I'm looking for a full size - open face type helmet. I like this one, but I have an issue. Does anyone know if I can fit basic eyeglasses while wearing this helmet? I wear not so dorky Buddy Holly type classes. BEST ANSWER: I wear glasses of a similar and I just bought this helmet. If you're going to wear a shield, it gets tricky. I have to remove my glasses, put the helmet on, put my glasses back on, and then snap the blast shield in place. But I have to do this with just about any helmet I wear, so it's not much of an issue for me. However, if you have a bubble shield, I find that they are harder to snap into place with the helmet already on. Yes, you can fit regular sunglasses while wearing this helmet. My son wears classic Ray Ban Wayfarers and he looks really cool. Do remember the opening is smaller than typical helmets so your peripheral vision is more limited than with other full face helmets. 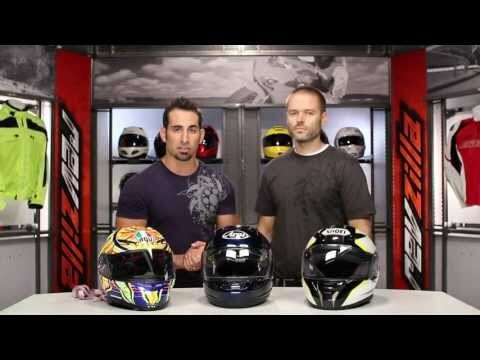 The Shoei is also a nice basic full face. Yes, you totally can. When I'm not wearing a bubble shield, I throw on a pair pair of glasses and am totally comfortable concerning fit around the temples. I highly recommend this helmet. It's super comfortable and minimal. I would think so, I wear Aviators with this helmet all the time and it's very comfortable. I've seen a lot of guys wearing Wayfarers with the helmet and they're the basic shape of some Buddy Holly style glasses. I have this helmet and use a 3 snap shield with glasses. Snap the 2 outside snaps, put on the helmet, lift visor slightly and put on glasses, then snap the center snap. No problem. Does the Matte Titanium color lean toward silver or gold? Thanks. BEST ANSWER: Silver.. I Put a smoke mirror on it and it looks like an astronaut helmet. Lots of compliments.. It's more of a matte gold. I have 3 questions. 1: Is the white more of a cream? I have a cream vespa and was wondering if it would look good. the stock photo looks more cream but the video looks more white. 2: how accurate is the size chart? does it run small or big? 3: does it cover your chin? In the video it looks like it doesnt cover his chin very well but I am a girl and have a smaller face. BEST ANSWER: 1. To answer your question the white does have a slight tint to it. But it's not quite cream colored, and when in the sun it's pretty bright white due to reflection. 2. The size chart is accurate, but take in to account after wearing the helmet for a bit the pads tend to wear down slightly. I measured 22 3/4 which is the cusp of an xlarge but I bought a large and it fits perfectly and the cheek pads are snug at first but begin to loosen. 3. Mine covers my chin. But that really just determines how your head build is. The video, the guy wears his pretty high. I tend to pull my helmet down and forward and it fits right at mid forehead and covers my chin just fine. Hope this helps! 1. To answer your question the white does have a slight tint to it. But it's not quite cream colored, and when in the sun it's pretty bright white due to reflection. 2. The size chart is accurate, but take in to account after wearing the helmet for a bit the pads tend to wear down slightly. I measured 22 3/4 which is the cusp of an xlarge but I bought a large and it fits perfectly and the cheek pads are snug at first but begin to loosen. 3. Mine covers my chin. But that really just determines how your head build is. The video, the guy wears his pretty high. I tend to pull my helmet down and forward and it fits right at mid forehead and covers my chin just fine. Hope this helps! I can't answer the first question, I have the black. The size chart seemed very accurate to me, but measuring accurately may be iffy so I would have a friend measure your head at least three times to make sure you get a good average, and for me it covers my chin. I think the guy in the vid and pics had his pulled up a bit. Also, at higher speed it tends to float up a bit. I'm a female, and mine covers my chin. I also bought the vintage white and it has a slight cream tint to it. It's close to the pictures, but I'd say it's a bit lighter in person. It's definitely not stark white. And I went with my usual helmet size and it fits nicely, a little tight in the cheek pads, but I have a round face. I have the white, it is a cream or antique white in color. Size seems normal, fits round heads (front to back) better than oval. Covers my chin fine, but I do have the large. The white is an awesome retro off white - google images of gringo and you will see plenty as they actually are. Hi will a Bell Custom 500 Retro 3 Snap Shield (flat not bubble) fit this helmet or will this only work with a bubble shield? I have a medium Bell Custom 500 and medium Biltwell Gringo and both Bell Retro Snap Shield and Biltwell Bubble Shield are interchangeable. The mounting snaps are spaced out a bit different between the two helmets but the shields have adjustable snaps that can be repositioned to fit either helmets. I would agree with Amber that the Bell shield is not as wide as the bubble shield, so the left and right edges cover JUST enough of the Gringo eye port, if that's a concern to anyone. But it worked well for me in the past. If the flat sheld has the outside 2 snaps on a slot so they can slide wider it will fit, the snaps on the Bell 500 are about 3/16 narrower than on the Gringo helmet. My old Bell Star shield fit, the 500 brim visor I had to modify. The flat Bell 500 shield fit my small size Gringo but with very little room to spare. May not fit a medium and larger sizes. Shield does cover the entire eye port, does not leave openings on the sides. I tried the flat shield I had and it worked fine, not sure about the Bell shield. The generic shield I have has adjustable snap locations for the three along the top of the helmet. No. That was my plan too but the flat 3 snap for the 500 does not quite fit. I had to buy the biltwell bubble.